Hunter Concrete of Jacksonville, Inc.
"Serving North East Florida since 1998"
The Home Owner's Choice for Concrete in Jacksonville! Thank you for taking time to visit us. We have been serving the Southeast for over 12 years now and have had great results. We currently travel throughout the entire Southeast providing our services. We are licensed, insured and fully covered with Workers Comp and Bonded with the City of Jacksonville. We provide quality work, competitive prices and the best service around. We specialize in three areas of our industry: Home Owners, Commercial and Restoration. When it comes to Home Owners, no one else can provide the quality of product and provide the satisfaction in service like we can. Commercial jobs are detailed to spec, by the book and we work closely with a structural engineer group that goes wherever we go. With Restoration we specialize in Coastal Regions dealing with concrete restoration on condos, parking garages, sea walls and more. So, no matter what job you have, we have you covered. If you want the best, do not look any further. If you want to speak with our past customers, that’s great because we want you to and we encourage it. You will learn from them that we are what we say we are: A company that stands behind the quality of our work and our customer service. We strive for excellence and it shows in our work. It doesn’t matter if you are a home owner or a large commercial builder; we offer the same products with the same service. We offer FREE Estimates, so please give us a call today and see for your self what it means to be a customer of Hunter Concrete of Jacksonville. 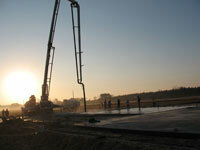 We are the Home Owner's choice in the Southeast when it comes to concrete. We have always said that "No Job Is To Small" and this has opened up the opportunity to work on some great jobs with some special people. We treat our Home Owner's jobs as if they were million dollar jobs. The same workmanship and the same service are experienced by both. If you are a Home Owner and are looking for the following, know that we are licensed and insured. 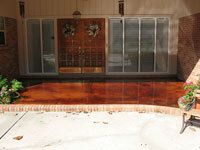 We give Free Estimates with competitive pricing that result in the best product that you will find in the Southeast. Browse the Home Owner section of our website to see past jobs that we have worked on. If you would like to speak with Home Owner from a past job that we have completed, please contact us and we will try to arrange this for you. Know that many of our customers are repeat customers, so our service and final product speak for themselves. We specialize in concrete restoration throughout the southeast using many different ways to correct certain problems found in concrete. Some Concrete problems in the Southeast can be found along the Coastal Regions and are a result of seawater and salt in the air. 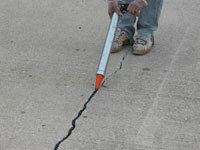 Other problems might be the result of normal traffic wear, or the settling of the ground under the structure. Many of these problems can be fixed without tearing down the structure and rebuilding a new one. There are many ways to deal with these problems and here is a list of things we do. Take a look at our Restoration section of the website to learn more about Concrete Restoration and what we can do to help. Please contact us if you have any questions. Hunter Concrete of Jacksonville has been working on Commercial jobs for many years. We can handle all types and all sizes of jobs. Whether it is working with a small firm or or working with the State, every job sees the same attention to detail as the other. We pride ourselves not only on our quality of product, but our cleanliness of our job sites and the safety that comes along with it. Here is a list of things we do. There are many services that we offer, so if you do not see what you are looking for, please contact us and if you have a job that you would like us to bid on, please give us a call. We are licensed, insured and fully covered with Workers Comp and Bonded with the City of Jacksonville.